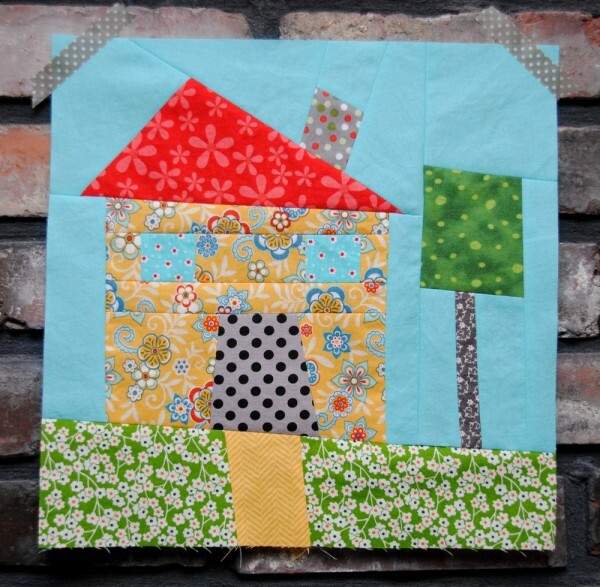 Quilt block 6 of the Round Robin is My house is a little wonky by Bonnie of Fishsticks. I met Bonnie at quilt market last year, and she is a delight! I have hit her up a few times for help, and she has been so gracious to listen and email me back! I adore her designs and wish I had little kids again to wear her cute patterns. I would like to think we have similar tastes…with the wonky house and having fun with designs. Her block is paper pieced, but don’t worry, the templates are all there, and she will give you great hints/tips on how to do it! This is great if you are just starting and would like to dip your toe into a new technique. 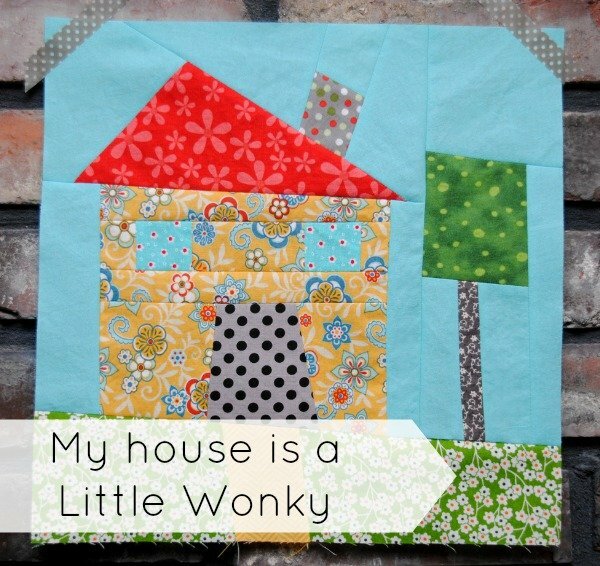 I chose this block, “My House is a Little Wonky”, because I love the whimsical nature of it, and the fact that it’s perfect in its imperfection. It has no picky corners to be aligned perfectly, and it lets you use your imagination a bit. My husband retired from the Air Force about eight years ago after 20 (“and a half!” he would add) years, and we’ve lived in a lot of houses. With each move, I immediately started decorating to turn our house into our home. One of the things all of that decorating taught me, is that no house is ever perfectly straight . . . ever. It’s not really visible from the outside or with a casual glance, sometimes you even have to climb up into those dark corners to find out that the walls are slightly crooked, but they always are. I think there’s a little life lesson in that. In spite of how we might look from the outside or at a casual glance, we’re all a little wonky, just like our houses. It’s a good thing, too. If we weren’t, life would be far too boring! This is part of the Round Robin Quilt Along Series-– for previous blocks and for theschedule of designers….clickety click here. 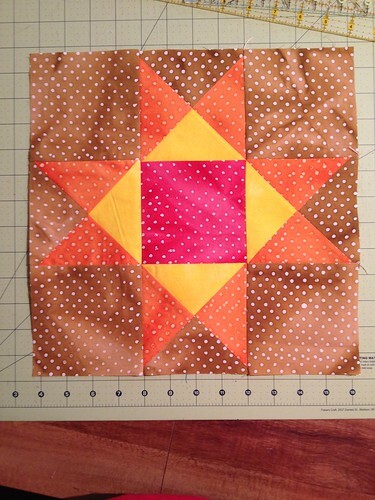 You will learn- paper piecing with freezer paper – The block will include a template. I adore sewing, and sew almost every single day. I have a tendency to sew things that are practical and useful, but still creative and fun to sew! I have a whole line of sewing patterns (both paper and pdf), including children’s clothing (lots of stuff for little boys!) and accessories for the whole family. I also love sharing tutorials, sewing tips, recipes, motivation and inspiration on my blog. I would be thrilled for you to come visit me! Random facts about me: I talk a lot . . . often telling people more than they needed to know. I can’t tell you how many times I walk away from a conversation thinking, “Why did I tell her that? !” I’m a little OCD and a whole lot ADD. I bounce everywhere and survive by making lists, lists and more lists. I love dark chocolate, and I have a ridiculously unreasonable fear of finding that I’ve accidentally walked into the men’s room instead of the women’s room. $25.00 Gift Card- Shop on them! How do you enter? You will need to upload one image of your quilt block to the flickr group. Winner will be announced next week with the next quilt block. 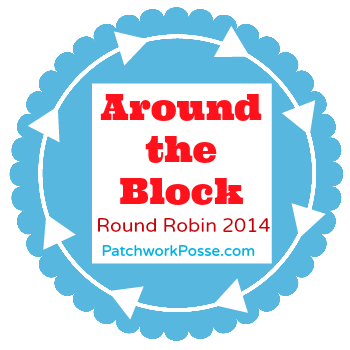 For all the Quilt Blocks in the Round Robin- Clickety Click here. Grab the button and spread the word! I see that I have won a prize. Happy dance. That is awsome. Can’t wait to hear more about it. Thank you so much. 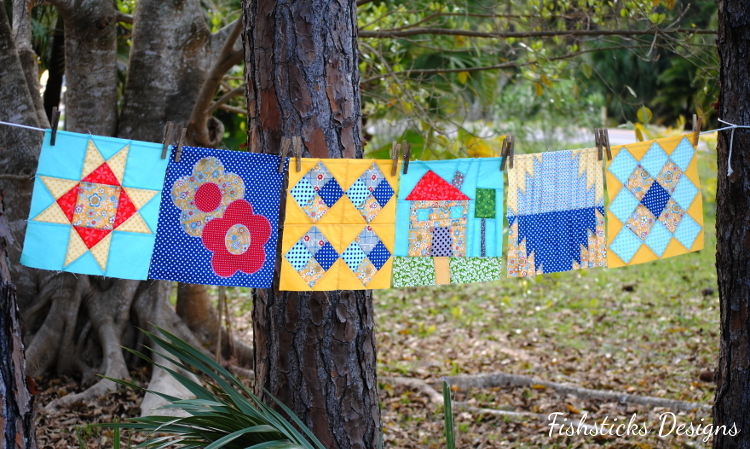 I am loving these round robin blocks and the way they are arranged in the pattern. I was finally able to print the templates for the Wonky House! Now I’ve discovered a new dilemma! Freezer paper is not available here. Any suggestions for a good substitute?